AUSTIN, Ind. — She became addicted to painkillers over a decade ago, when a car wreck left her with a broken back and doctors prescribed OxyContin during her recovery. Then came a new prescription opiate, Opana, easily obtained on the street and more potent when crushed, dissolved in water and injected. She did just that, many times a day, sometimes sharing needles with other addicts. Last month, the thin, 45-year-old woman learned the unforgiving consequences. 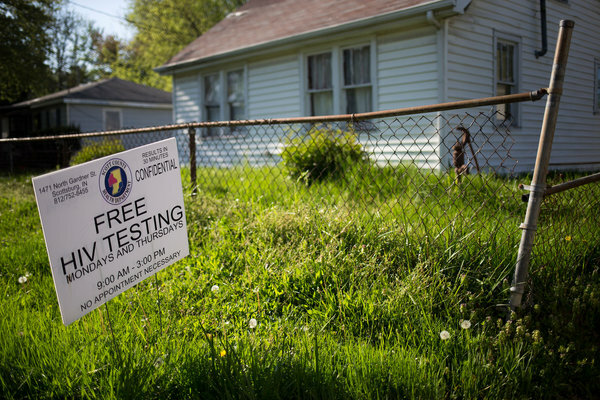 She tested positive for H.I.V., one of nearly 150 cases in this socially conservative, largely rural region just north of the Kentucky border. Now a life long hobbled by addiction is, like so many others here, consumed by fear. She is afraid to start antiretroviral therapy because she does not want to be spotted entering the clinic on Main Street, she says, and afraid to learn her prognosis after hearing a rumor — false, it turns out — that someone else with the virus was given six months to live. Other drug users have refused to be tested at all. The crisis would test even a large metropolis; Austin, population 4,200, is overwhelmed despite help from the Centers for Disease Control and Prevention, the state and nonprofit groups like the AIDS Healthcare Foundation. H.I.V. had been all but unknown here, and misinformation is rife. Attempts to halt the outbreak have been hindered by strong but misguided local beliefs about how to address it, according to people involved in the response. Gov. Mike Pence reluctantly authorized a needle exchange program last month, but local officials are not running it according to best practices, outside experts say. Austin residents still must wait for addiction treatment, even though they have been given priority. And getting those who are H.I.V.-positive on medication, and making sure they adhere to the protocol, has been difficult. Officials here say the need for education is urgent and deep; even local health workers are learning as they go. Brittany Combs, the public health nurse for Scott County, said she was stunned to discover from talking to addicts that many were using the same needle up to 300 times, until it broke off in their arms. Some were in the habit of using nail polish to mark syringes as their own, but with needles scarce and houses full of people frequently shooting up together, efforts to avoid sharing often failed. 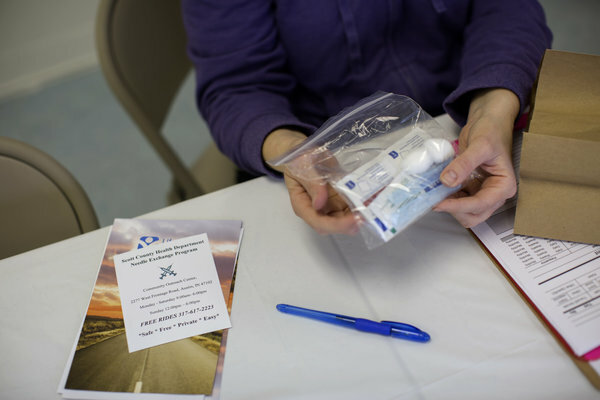 Ms. Combs also learned that many addicts were uncomfortable visiting a needle distribution center that opened April 4 on the outskirts of town. So she started taking needles directly to users in their neighborhoods. At the same time, H.I.V. specialists from Indianapolis — who have evaluated about 50 people with the virus here so far and started about 20 of them on antiretroviral drugs — are fighting a barrage of misinformation about the virus in Scott County, where almost all residents are white, few go to college and one in five live in poverty, according to the census. Another complication is that the needle exchange has faced strong local resistance. Mr. Pence, a Republican, generally opposes such programs, saying they perpetuate drug use. Many residents here feel the same. But researchers say Scott County’s hastily created exchange has several features that could sharply curb its effectiveness. To get clean needles, drug users have to register, using their birth date and a few letters from their name to create an identification number that goes on a laminated card. The police are arresting anyone found with needles but no card, saying it will prod more people to participate. Shortly after the needle exchange began, sheriff’s deputies visited a house in Austin and found a man who had joined the program and a woman who had not. They did not arrest the man, Sheriff Dan McClain said, although they confiscated a number of clean needles he had received from a volunteer group that was not part of the official program. But they did arrest the woman, who had “a freshly used needle lying next to her” in a bed spattered with blood, Sheriff McClain said. “If they’ve got one needle and they’re not in the program, they’re going to jail,” Sheriff McClain said. For now, the program here is giving out a maximum of 140 clean needles per user per week to whoever goes to the outreach center or accepts them from the roaming minivan. Ms. Combs said some people told her they injected as often as 15 times a day, and the exchange is erring on the side of providing slightly more than people need. She has passed out needles at a house where the owner, an older woman known as Momma, sits on the porch while a steady stream of visitors comes to shoot up inside. She has knocked on the door of a trailer where, she said, “multiple family members live and the daughters all prostitute themselves out and everyone is doing drugs.” One recent afternoon, on a street fragrant with lilacs, a young woman on a bicycle declined Ms. Combs’s offer of clean needles, saying she already had some — and H.I.V. “I know I need the medicine to slow it down,” she murmured. At a run-down house with a wheelchair on the porch, Tiffany Prater, 27, walked out to greet the van, saying, “The needles ain’t lasting me long enough.” She beckoned two men out of the house to get some, too. The van moved on, stopping as someone yelled from a white house with a broad lawn. A woman in a pink tank top emerged, saying a neighbor had taken some of her clean needles and her daughter’s, too. The daughter could not come out of the house — she had just injected and “can’t get up from the kitchen table,” the mother said. Ms. Combs gave the woman needles for her and her daughter. “Spread the word that this white vehicle is a friendly mobile,” she said. As of Tuesday, the exchange had distributed 9,491 needles to 223 people, including many repeat customers. About 8,300 needles had been returned to the exchange, but not all of them came from the exchange program. Some participants say they are happy to have clean needles but would be happier in treatment. While some intravenous drug users from Austin have recently gone into treatment at a residential center in Jeffersonville, about 30 miles away, others are still waiting for a bed. A 23-year-old user with H.I.V. said he had gone to the community outreach center to get clean needles and seek addiction treatment, but was put on a waiting list. Two weeks later, he is still waiting. Opana remains easy to get, he added, a quarter of a pill selling for $40 — enough of a dose to ease his withdrawal symptoms and enable him to get out of bed. One unexpected benefit of the H.I.V. outbreak, according to the woman who tested positive and fears starting treatment, is that the men who used to stream into town daily, seeking young female addicts who would prostitute themselves in exchange for drug money, have all but disappeared.